There are plenty of 電車オタク (“railroad buffs”) in Japan…but I don’t think any of them have their own actual train! I used to ride on steam locomotives, esp when gr’pa worked for the railroad. Do you remember that he worked there? When I was young, we would take the train to NYC. It was always fun to go to the big city. We also took a train across the US, to California, when we went to visit Australia. We were on the train for one whole week. It got really boring esp about the 3 or 4th day-we were so happy to finally get off by the end of the wk. from there we went to Hawaii and then flew to Australia. >Do you remember that he worked there? I know that he worked for the railroad but I was too young to actually remember it. I didn’t know he worked with steam trains, though. I’ve also heard about your trip to Australia when you were a child…but I didn’t know you took a cross-country train journey. I do believe Japan’s rail system is the best we’ve seen in the world, certainly better than Chicago. 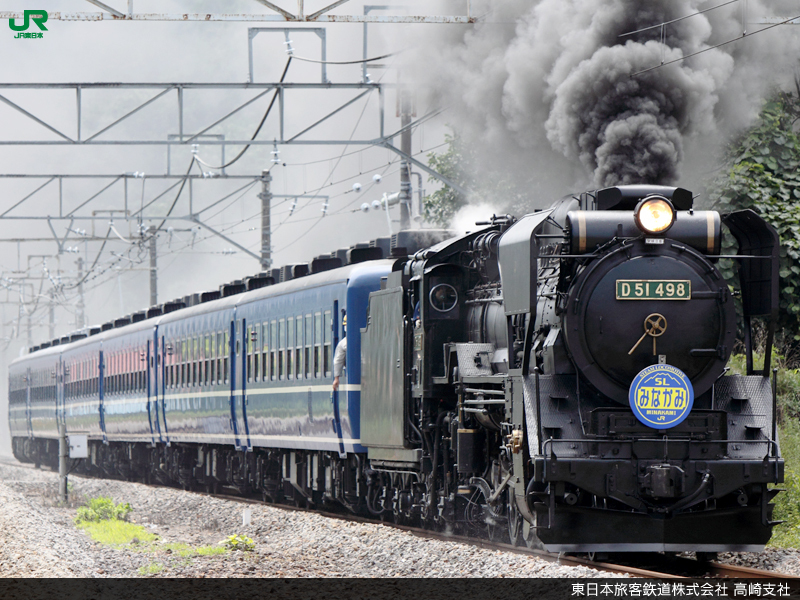 I wish we could do the steam locomotive but we won’t be in Japan until spring of next year. Are you going to visit Japan next Spring? Have you ever visited here in the springtime before? Yes, we’re planning on it, unless my brother can’t get away and would like to do the trip in fall. Yes, we were in Japan in spring, 2010 and I blogged the entire time. That was crazy for me to do. It was too exhausting. We brought my mom and aunt with us and it was one of our BEST trips to Japan. We visited the top three gardens, saw several castles including Himeji before they closed it for renovation and stayed at Eiheiji Temple for the night. It’ll be hard to top that trip next year. >we were in Japan in spring, 2010 and I blogged the entire time. Oh yeah, I read your post. >It’ll be hard to top that trip next year. If you want some ideas for places to see in the Tokyo area, let me know. It was interesting and my son loved it, but I really hated all the thick, black smoke puffing out. We sat near the engine and so couldn’t have the windows open because the smoke was so thick (it was summer, and of course no air con!). I guess they have them in rural areas around Japan. Now the closest one to Tokyo is the one in Gunma that I wrote this post about. >I really hated all the thick, black smoke puffing out. >it was summer, and of course no air con! Yes, in August. It’s for work. I’ll be there at least a year. Shizuoka wasn’t my choice, but it seems really perfect for me. Isn’t there a SL route like this in the Oi River Valley in Shizuoka? I should’ve specified…there are no more permanently-running steam locomotives in the 関東地方 (Kanto (Tokyo) region). The train in the link you provided looks fun. How did you know about it? Have you ridden it? No, I haven’t ridden it yet. I’m moving to Shizuoka-shi soon, so I’ve been looking at fun things to do and see. You’re moving to Japan? When? For how long? As “spiffy” as Japan is today, I still wax nostalgic over my earlier memories. I can’t imagine that in Japan! That is how Japan is.